They would be ideal to display around your home or from your tree at this special time of the year and you can make them as sparkly as you want. 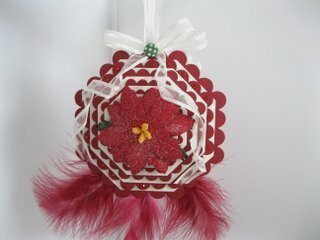 They are so easy to do that you could get your children involved making them in different colours and shapes, and adding in any embellishments that you have in your "Stash"
Many of the Spellbinders Nesting shapes are suitable for this decoration ... squares, ovals, diamonds, pennants or circles. They just need to be nesting so that you can cut all the layers that you need to build the decoration up. So here is a very short video tutorial to show you how I created this decoration for my house this year. 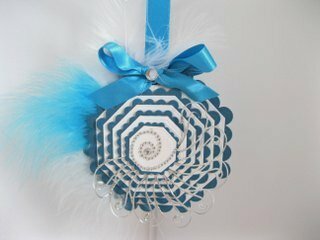 Make sure that the ribbon you add to the centre of the card is long enough to allow you to hang the decoration where ever it is you wish. And to the centre of each of the bows I have added a small piece of Card Candi to hide the knot. 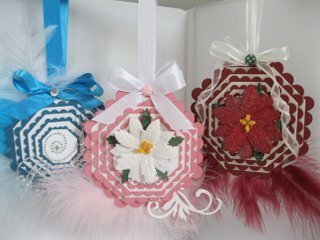 Make your Christmas Decoration in the traditional colours. Or try something new for this year and use pastels or more vibrant colours that are so popular. But whichever way you decide to make it I am sure that it will make a really good addition to your festive decorations and will cost you pennies to make. And because of the size of them you won't need many to dress your tree. Make these with children and let them choose some of the colours and perhaps they are an idea for them to give to their friends as a little gift.